Real life has been getting in the way again but I’m going to try and do a bit of catching up on some recents successes in the kitchen. 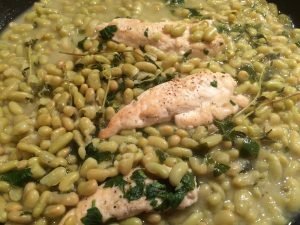 Sometimes I just have to have some beans for my dinner and Nigel Slater’s chicken, haricot beans and lemon did not disappoint. And it’s a lovely quick dinner, quite easy to rustle up after work. This was particularly tasty, as I popped to the Ginger Pig on my way home from work for the chicken. I also used posh French beans in a jar, although tinned would be great too. Cut the chicken breasts in two (or ask the butcher to do that for you) and season them with salt and pepper. Warm a little olive oil in a salute pan and brown the chicken on both sides. Add the drained beans to the pan with the thyme, chicken stock and the juice of a lemon. Bring the stock and beans to the boil, then lower the heat and simmer for 10-15 minutes, basting regularly. Stir in the parsley and check the seasoning. 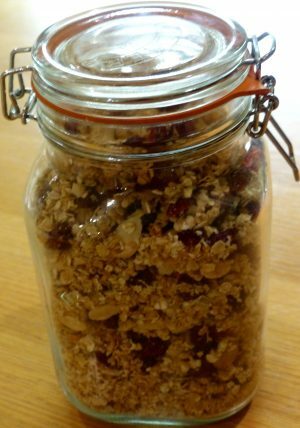 Mix together the porridge oats, seeds, nuts, coconut and salt in a large bowl. Heat the honey/maple syrup, olive oil, cinnamon and nutmeg and stir until melted. Mix the oil mixture into the oat mixture and stir well to coat the oats. Line two baking trays with baking parchment and spread the mixture on the trays. Bake for around 30 minutes – check after 15 minutes and give it a bit of a stir. I like it quite dark and crunchy. Remove from the oven and add the dried fruits when the mixture is cool. It should stay fresh in an airtight container for a while – I don’t know how long, as it doesn’t hang around that long here.